Who doesn’t love a beauty sample? Show me a woman who doesn’t love a sample and I’ll show you a… erm… hedgehog! LOL! I don’t think you can find anyone, male OR female, who doesn’t love being handed a bunch of samples at the cosmetics counters. It gives us the psychological effect of getting a “deal”. Quite often, if you ask if there are any “gifts” after your purchase, the odds are that you will be given a product sample. Quite often, it will be a skincare sample. Sometimes, it comes in a one time use sachet form, or more generously, you get a little bottle or tube or jar. A deluxe size sample, as they call it in the cosmetics circles. Quite often also, what do we do with these samples? Right. We save them for “when we travel” because they are “so useful for travel”. Sometimes, people even sell deluxe samples like the ones you see above. There are even online STORES that specialise in selling skincare samples, and when beauty subscription boxes were the rage, that’s all you basically got. Incidentally, I don’t know if subscription boxes are still a thing – anyone want to enlighten me? The scary thing is that, there are people who actually buy these samples online from online stores that specialise in selling samples. And they tell me, “You know, if I buy a 15ml sample for RMX and the full size 50ml product costs RMXX I’m actually saving money because if I buy 4 sample bottles, I can get more product for less!” Well, I’m going to give you 5 very good reasons why you should not be buying skincare samples and in fact should be wary of using cosmetics samples! The logic behind sampling is sound. If you try a product and like it, the odds are high that you’ll return and buy a full sized product. Kiehl’s builds their marketing strategy around this, as do many Korean skincare brands. In Korea, walk into any skincare store and you’ll be given so many samples, you might feel embarrassed. Or pleased. As you will. But here’s why I will warn you to be careful and wary about skincare samples. Take a look at any of your skincare sample sachets or bottles or tubes or jars. They may be miniature sizes of the full sized product, but they rarely state an expiry date. Sometimes, larger sample sizes state a date, but they’re usually the exception rather than the norm. Most of the time, I’d expect the samples at the counter to be recent and fresh. But the truth is that we don’t know that. I’d be even more wary especially about buying samples from online stores or ebay. You have no idea how OLD some of those sample products are, and there’s no way to tell. So imagine if you then take it home and keep it in a dark cupboard for “when you travel” in the future. Then you forget about it and rediscover it 2 years later. How do you know it’s not already expired? Do you still use it then? How often have I used a sample product, only to be let down by the full sized product thereafter? I actually feel that quite often, the sample products are superior to the full sized, so it makes us want to buy the full sized product 😛 I have a suspicious mind that way. So, as far as I’m concerned, if I use a product sample, it’s purely to test the scent and texture. I don’t place any score on efficacy, because there’s usually far too little product to be truly effective. Anyone who tells you that they see an effect immediately after using a one-time use sample, is deluding themselves and you. This is also true in the case of samples of foundation. If I receive a sachet of foundation sample, rarely does the texture translate to the real thing. There is a difference between a smear on a foil sachet, and a liquid in a bottle. So I test to see if it oxidises or for colour match, and that’s it. Skincare? I never judge a product by its sample. Quite often, a full sized product may come in a glass jar, or a pump bottle. But in the sample size, it comes in a foil sachet, or a plastic bottle/jar. Does it ever make you wonder if the foil packaging or plastic is actually appropriate packaging? How do we know that it hasn’t reacted in some way to the sample packaging? This is true particularly of those that come in jars or bottles, less so those that come in sachets, because we know sachets are sealed all round. Most full sized jars or bottles come sealed, or with a security sticker somewhere on the packaging. Samples never do. Hmm… Ever wondered what else might have gone in? Or if you buy these samples, ever wondered if you’re getting the real thing? Hmm… which brings me to my final point. Unless you get your product samples from the cosmetics counter or an authorised distributor or store, you could well be getting a fake product. I’m not saying that these online stores or auction sites are selling fake goods. I’m just saying that there’s no way you can tell a real sample from a fake. Packaging for product samples vary and aren’t standardized. Smaller samples come in foil sachets. Larger samples come in bottles that may or may not resemble the final product and even then, comes in different sizes. Whereas, full sized products come in only 1 or 2 standardized packaging. So, who’s to say that a sample you’ve purchased isn’t real? I don’t know. Maybe time will tell, after your skin reacts. So the upshot of this is that while I think that product samples are a great way to try out a new product or to familiarize yourself with a new product, or even to travel with (more on this another day!) we do have to be very wary and careful about using these product samples. Above all, please don’t buy skincare samples off the internet. Samples are free for the asking at any cosmetics counter. Sure, sometimes the SAs may look down their noses at you, or be all uppity, but ultimately, if you persist, there’s no good reason for them not to give you a sample of the product that you want, unless they don’t have any on hand. 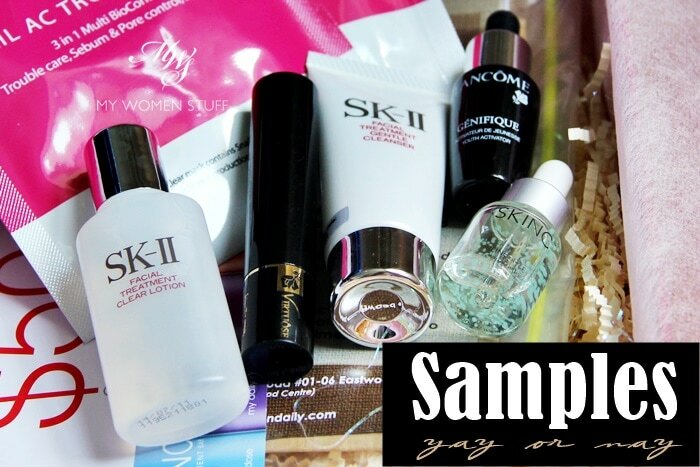 Any cosmetics counter worth shopping from will have samples at hand. Perhaps not the product you want, but of other products you can try. With makeup it’s always harder. Usually, the only samples available are of foundation, and even then, only of 1 shade. So you can test for texture and maybe allergy but little else. Lipstick samples are useful for testing colour, but again, little else. The texture is rarely representative of the actual product. I rarely bother, if I’m to be honest. Are you a beauty product sample collector? Have you bought skincare samples off the internet? NEXT POST: Mini but Mighty: The Hourglass Ambient Lighting Edit Palette shines! I couldn’t agree more…i have lots of skincare samples but hardly using them. One my friend used to ask the SA to write the manufacturing or the expiry date over the samples sachets however i still reluctant to believe it. That’s clever of your friend! But then, as you’ve pointed out also, they may not even know when the dates are, so how can we be sure that it’s the right date eh? And hence, I don’t keep samples! I use them as soon as I got them, instead of keeping some of them in case I travel. Apparently, I don’t mind lugging full sized items in my wash bag. LOL! You’re right about buying samples though. Samples are meant to be GIVEN out, not bought. I wonder how these online stores get them because I doubt the brands themselves would like to see their samples being sold. Don’t you think? I only carry full sized face items, cos most of the time they don’t exceed the 100ml mark LOL! I tend to prefer not checking in my bags when I travel especially on my way out, to save time, and that means I do need a few sample sized items for face wash and shower stuff etc. But other serums/creams usually are full sized. I don’t get that trend of selling and buying samples. How on earth did they get their hands on the samples to start with?! Hello Paris! I’d say yes, yes, yes and more yes to your initial questions. I love deluxe sized samples because they’re usually cute and one of my pet peeves is to decanter – so the deluxe sized samples usually stay in the darkest corner of my dressing table waiting to be whisked along during the elusive trip. Of course when I buy a big bottle and then I get another 3-5 miniature versions of other essentials like serum and toner etc., it does make me skip home happily. You’ve written a very good piece and they’re common sense, if not common practice. For me, be it deluxe sized or sachet samples, they’re a good form of product discovery. Like the Estée Lauder eye cream deluxe sample that came with my purchase of another product, that’s how I came to learn that the eye cream was fairly easy and comfortable to use. Then I went back to get the full size eye cream. I’ve been culling the sachets because I can’t remember when and where I got them. It’s sad to throw out those deluxe samples but then again they might be way past their expiry dates. So thanks again for this good reminder that samples should be used right now and not saved for that special trip! oh dear i do have a lot of those samples in sachets for ‘when i travel’, but when i do go travel, i am too lazy to dig out the samples from the dark dark dark cupboard. time to do a house keeping and chuck them all. i don’t know how long i have had them, it could have been 5 or 6 years even! OMG! I thought I was alone in suspecting that samples are made superior to the full-sized product! Personally, I draw a distinction between product samples and gifts. Gifts are when I get a sample sized or deluxe sized item when purchasing my normal skin care. I request that those items match the line that I use which only makes sense since I know they work. I do keep those for travel. As for samples, I don’t get the point of giving samples of a product if it is only given when you purchase the full sized item. The entire objective of a sample is to enable a potential customer to see if the product is suitable to that particular individual. I would not bring these on my travel no matter how convenient the idea may seem. The last thing I’d want to happen to me on my travels is to have a reaction to a new product. I do think that samples can be very useful. I have sensitive skin which often reacts immediately if something is unsuitable. So skin care samples are important to me for that reason especially if they cost a lot. I wouldn’t want to plonk a chunk of RM on a full sized item only to find that my skin reacts to it at first use. I’m less fussy with make up samples. I love the cute Chanel lipstick samples I received which actually lasted me a really long while! 😛 And the Urban Decay samples of the eye primer that I got from Sephora convinced me that I needed eye primer in my life! Oooh! I used to have that dilemma of whether to keep the half used bottle for the next trip but I’ve now made it a personal rule to use up whatever is leftover from my trip and just bring a new bottle/tube for the next trip. Otherwise, I simply can’t keep track of what has been opened and how long it has been opened! I do buy samples off the internet. It lets me sample various skincare, there are some which I repurchase full size , but also some duds which saves me from splurging on full size. It’s good to know that you’ve had a positive experience buying samples online. My only concern would be where they came from if they’re not from the original manufacturer or an authorised distributor, or how it is stored and how long they’ve had them in store. Hence my doubts about these online sample sellers. I’ve seem some pretty unsavoury practices over the years from what appears to be a valid online company, that makes me even more suspicious! I love samples! But yeah, i dont usually use them though. I do agree with you sometimes we tend to keep them till it expired. LOL! It’s even weirder for me to find that sometimes samples works for me but not the full size products and vice-versa. Hands up for the joy of seeing my sample collection grow bigger and bigger ( in the past ) while waiting to be used on a trip, which rarely happened. And the funny thing is, I rarely bring those samples on any trip because i) I don’t know whether it suits my skin, will I breakout or how is the texture and scent and all … ii) I’m kiasi and kiasu if I run out of my skincare if I bring those tiny tube. So to prevent this, the least I bring will be a deluxe size gift. And I will finished up the product at home after the trip to bring a new tube on next trip. Now, I only ask for samples if I’m interested in it. As for GWP, I’ll request for items I need or use up fast. I no longer wait till I reach home to see what the SA gave me. I guess I’ve passed the exciment stage (age) in receiving sample or gift with purchase. I have a habit of writing the date I get the gifts or sample if the info is not printed on the bottle or if I couldn’t get the info from this website on checking manufacturing date. This helps me to decide which product to use first, be it full sized product or gift. Yes, thank you for this! I recently had a few of the same thoughts. I mainly use them to test for scent (because I don’t like strong scents in skincare usually) and sensitivity to the product. Except for Paula’s Choice, which sells their own sample packets, as well as giving some with purchase, I didn’t realize people would buy samples from persons other than the brand store/ representatives. I guess I wouldn’t trust samples from just anyone, and don’t put much trust in samples from the store to be completely representative of the full-size, that I didn’t think buying them was a thing. And there’s always small containers and ways to make full-size products travel-friendly oneself. I keep the samples aside when I receive them, and use them when I go for exercising / swimming / trips. I don’t reserve samples for trips because I don’t have the luxury of travelling often, so I figured why not using them for after gym sessions. I realized the horror of hoarding samples when I came back from Seoul 3 years back, and I’ve been careful since. My samples collection is less than half a cosmetic pouch full and I’m intending to keep it that way. Great post! Man, I used to hoard samples like they’re going out of commission the next day. I had a very big box of them to the point where they were overflowing. Early this year I threw away 90% of them because I kept so much but never used them. Goodness knows if they’re already expired! I’m 99.999% sure they are. The only samples I keep and request for these days are body wash, shampoo, conditioner, a moisturiser I’ve actually used, eye cream and cleanser. I wouldn’t dare use anything else! Hi, Paris. I was wondering if Nars Malaysia has the An Abnormal Female Lip Pencil Coffret? If they do, do you remember the price? Thanks. Hi Maria, I’m afraid I don’t know if they have it or the price, sorry! Wah. This is a timely reminder for me to start using all my samples, and not accumulate them. It is so true that samples hardly have any expiry date. I just took them out and yes…non have any dates indicated on the sachets. Actually, I try not to use samples when I travel because….what if it doesn’t suit my skin and I’m left with no alternative in a foreign land. Of course, unless those are samples of products I’ve already tried. Glad to have been a wake up call, Nicole! 🙂 Yes, time to break out all those samples, especially the nice ones. I have these samples of Jo Malone shower gels and body lotions that I keep saving to travel with, and then I don’t because I think, Oh, it’s too nice etc. Eventually, I broke it out and it made showering after a long day out, so much nicer! But you’re right about face products – it’s just too risky using something you’re not familiar with. AIyo, this used to be me. I’ve never bought samples online but I hoarded like crazy during the beauty box rage and such. I’m actually on a mission to finish up ALL of my samples – I saw a hashtag on Instagram that was something like #sampledoutin2016. I indulged in travel size tubes, pots, sprays, etc. from Muji, and now I just decant whatever my “real” skincare or makeup product is into smaller packaging for travel. Who wants to risk using a new kind of face scrub right before a work conference, or on vacation or whatever? Color cosmetics samples are definitely harder to use up than skin/bodycare, but I’m trying my best. More than 5 years ago, I bought a few samples for a couple of dollars off the internet. However, I stopped as the business model just did not fulfil what I was looking to get. Furthermore, I discovered that the makeup counters are just as happy to give out samples for free! Why buy samples when cosmetic giants love passing me free samples? In addition, as you have said, I only want to test the texture and sometimes colour on my skin, so I could get that done at Sephora or makeup counters themselves. I also learned my lesson after I hung on to two subscription boxes for a year. I loved the feeling of getting the gift box every month. But like what you said again, I hardly use them. I do not go out of country enough to bring so many travel sizes. At home, I have full sizes of products that I already love. Till now, I can live on those samples I had accumulated from subscription boxes. Haha the subscription box thing really made the sample hoarding tendency explode! I honestly don’t know if many are still in business or if their business model is actually a successful one. Some that went on to build a business around selling the full sized items in a webstore would probably be more successful. Those who only depended on samples? I”m not so sure! These days I’m far more practical. I used to receive subscription boxes (how novel they once were) but then I realised that you get far more unsuited products than suitable ones and I was drowning in samples I wouldn’t use. I totally agree that you should use them asap, or dispose of them. Luxury sized samples are super nice for travelling with or just for trialling out, as you get far more of an idea what a product is like. Beauty subscription boxes! Do you know of any that are still in business, or at least that people are still going gaga over? I remember when they first came out and everyone was sharing and blogging about them. These days, I don’t even hear of the brands anymore! I agree mostly, especially when it comes to buying/using them regularly as a cheaper alternative to the whole product, but I do find samples immensely useful as a way to try out a product and see how one likes it before committing to a full size one, and providing you do travel not infrequently, for travel (it’s just so satisfying to be able to pack a whole routine in for a few days in a small makeup bag, and you know won’t spill). And I think with brands that are known to give out samples readily, there may be a bigger leeway when it comes to expiration dates just because they’re regularly handing them out and shouldn’t be too old (vs a brand who is stingy and rarely gives out samples, those are the ones I feel like could be extremely dated products because the turnover is so low). Samples are the same product as the full size ones. Factories usually run one lot of samples when they are running production for the full sizes. However, it would mean that one lot of samples can last quite a while, in terms of distribution. At least, this is true where I used to work. But I do agree that less people check on expiry dates for samples. That’s quite risky because the product may become unstable past its best before. Eeps! duly chastised, Daphne 😉 Sometimes, I think the sample packaging/sachets make them more unstable more quickly too. There’s a reason the full sized item doesn’t come in a foil packet right?